There's been a lot going on in footy relating to New Zealand lately. Two young Kiwi born players have made their move on the AFL, one of their internationals has moved to Melbourne, and one of the key people in their recent success has moved into Rugby administration. Footy in Stockholm is now three years old, with the organisation now working on adding a solid juniors foundation to its operations. The league had a few early setbacks this year - the new team in Linkoeping failed to form, then discussions for the Dynamite to join the SAFL's Regional Premiership were knocked back at the Scanian end due to the southerners not wanting to add the extra travel committments. Despite this, Stockholm have continued on, adding a three-match tour series against the new Helsinki-based footy scene and working hard to bring Aussie Rules to Stockholm schools. This report courtesy of Stockholm's Damian Waldron and Ben Kirk. One of the AFL's initiatives to encourage more New South Wales youngsters into Aussie Rules is now underway. Whilst as many as a dozen Queenslanders may make their AFL debuts in 2006, testimony to the great strides being made in that state, the greater Sydney area remains relatively unsuccessful at generating draftees. The apprenticeship system now being put in place allows and in fact requires each of the 16 AFL clubs to take on a younger player from NSW, hopefully to increase their development and provide an incentive to other talented juniors that have a choice of many sports. It's hoped this will be extended to international juniors. With the formation of the SCAFL this year the Californian football scene returns to be one of the strongest footy regions in the US. The six round metro format competition has seen the Inland Empire Fire, 951 Purple Raiders, the OC Bombers and the LA Swans battle it out and bring regular competition for veterans and rookies alike. The 2006 Papua New Guinea National titles have been postponed to September, due to concerns that too many regions could not afford to attend. This is a reminder that for all footy's great gains in PNG in recent years, the country is by no means weathy and travel is a major commitment. On a brighter note, there is a suggestion that an Aussie side may travel to PNG to play, and the Arafura Games are on the agenda. The Croatian footy team arrived in Vienna on Saturday June 10th, happy to be able to play its first game ever. The team was participating in the Schnitzel Cup, alongside the Czech Lions and hosts Austria (the Vienna Kangaroos - recently rechristened from the Vienna Dingos) in the first tournament of their fledgling tri-nations series. As the Austrian and Czech squads had a few years' experience in playing footy, Croatia came in as underdogs, but won both their matches to run out champions of the day. In 1999 I joined the Milwaukee Bombers and became one of a small group of people pioneering footy in Wisconsin. In those early days, I would drive an hour and half up to Milwaukee to run around with 5 or 6 (not so fit) Australians and the odd American (often quite odd). I think it was after my first practice, that I was given the email address of a bloke in Madison and told to start something in my home town. Gary Hill, a physicist, and I would run regular training sessions in Madison and we even hosted a couple of games. The numbers were always light and Milwaukee always got stomped on by Chicago. The two clubs got so sick of the one-sided games that it eventually led to an on-field fight. You've gotta believe that things are pretty bad if the on-field scuffles are over footy administration. Things have changed a lot since I left. 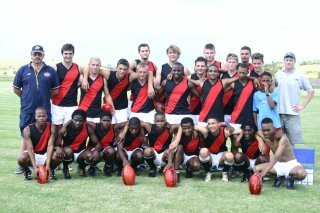 Last year the Bombers hosted the USFooty Nationals and they have become one of the dominant sides of USFooty. The Japan AFL held its annual two-day Australian Rules Football Carnival, the International Narita Cup, over the previous weekend, June 10 and 11 2006. Originally only contested by Japanese based teams, a rapid growth in the competition followed the 2001 inclusion of Australian VAFA team, Box Hill North. Box Hill North return again in 2006 hoping to avenge their 2005 grand final loss to the Japanese national squad, the Samurais, who have been forced to compete without star players Michito Sakaki and Tsuyoshi Kase, both trying their luck in Australia after training pre-season with AFL club, Essendon. The New Zealand AFL, reigning International Cup champions, have announced their squad to contest the 2006 Australian Country Championships in Queensland in late July. This historic occasion will see the Kiwi's league up against some of Australia's finest country talent in a huge challenge for the New Zealand team. As reported recently, the Western Australian Football Commission and AFL club Fremantle are interested in working with the AFL on the quickly growing South African footy program. It seems current league leaders West Coast aren't to be outdone by their local rivals, and are also discussing a training program there, no doubt looking at the excellent facilities at Potchefstroom. The BBC UK Northern Ireland site reported this week that Martin Clarke will have a five week trial with an unnamed AFL club this July. We earlier reported that an Irish newspaper reported he had been offered a contract by the Brisbane Lions, but a further report in the Irish newssite Unison.ie (registration required) reveals that Collingwood are bringing him out to Australia in a few weeks. Further to our story Subiaco set for world class upgrade as footy facilities become an issue, it has been announced that many of the suburban training grounds of Victorian AFL clubs will be upgraded in the next few years, funded by the AFL, the clubs, the state government and local councils. And the upgrade of Subiaco is far from certain.